Another week, another vegetarian haggis to sample. This one is made by Macsween and was bought from Sainsburys. I liked this one even more than the last one. It was delicious. Not too dry, not mushy, just perfect and with a lovely texture and flavour. It was also very filling. Oats, water, lentils (8%), rapeseed oil, kidney beans (5%), rehydrated onions, carrot (3%), swede (3%), mushrooms, sunflower seeds, pumpkin seeds, salt, spices, pepper. Posted in Journal and tagged ethics, food, Vegan, vegetarian. Bookmark the permalink. I once bought the non-vegetarian one in Scotland but never tried it. I couldn’t bring myself to it the stuff. This looks more like food! Yes, the real haggis certainly does sound disgusting! It’ll put hair on your chest and a spring in your step 🙂 On a slightly more serious note, I’ve never understood why the manufacturers of vegetarian food name meat replacement products after the meat product they are replacing? 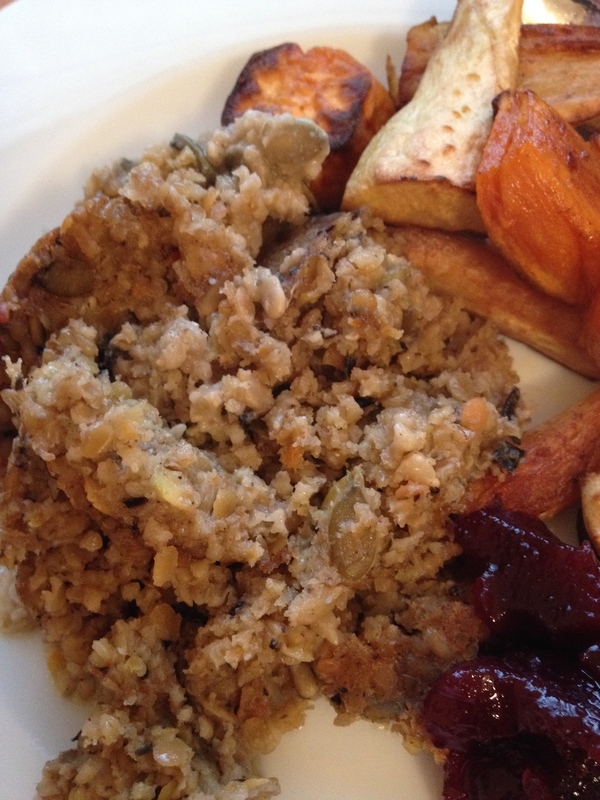 Vegetarian haggis, tofu turkey, vegetarian meat paddies etc. Why not just call it something else? I can’t imagine the vegetarian haggis tastes like haggis and I know the tofu turkey definitely doesn’t taste like turkey. It’s a marketing ploy and it makes vegetarians feel like we haven’t been forgotten. It also helps meat-eaters when they’re catering for a vegetarian and don’t know how to cook a meal without meat. If you can make a sausage without meat in it then why not call it a sausage? 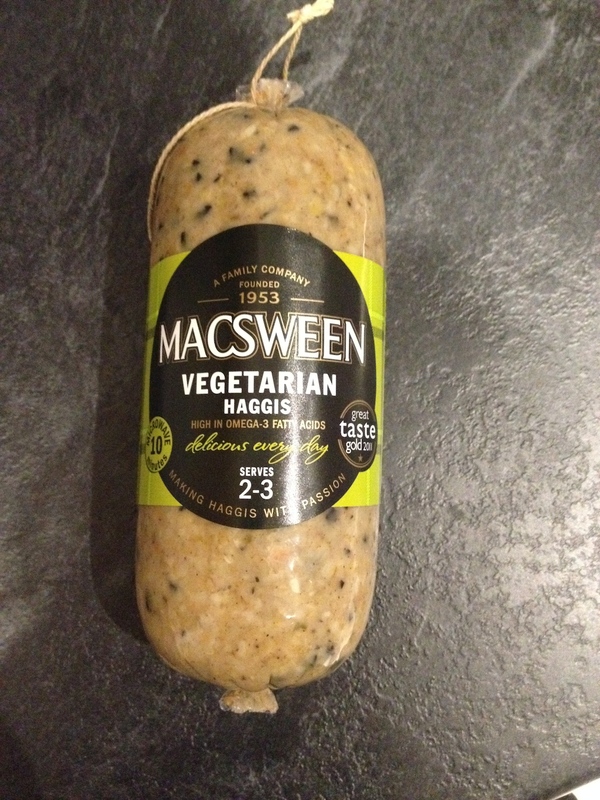 Ok, so the vegetarian haggis is quite a long way from real haggis but cheap sausages these days don’t have much meat in them anyway. And I call vegetarian burger patties – burger patties – rather than meat patties, because they’re perfect for putting inside a bun. What else would you call it? I’ve never seen or tried tofu turkey but have heard of it and I think it’s rather clever and sends the message that you don’t have to kill a turkey to enjoy thanksgiving. I like all the ingredients in it…I think. Sounds good. I didn’t understand the % part. I saw the 19% part. What was the other 81%? I wondered the same thing. I’m guessing the 81% is oats and water. I type “vegetarian” into the online supermarket to see what comes up. There’s all sorts of yummy things there. That haggis looks quite yummy. Better than tofu! This is wonderful! It deserves a post all to itself. I hope you don’t mind if I publish it to a new post. No probs, thanks to Tim! Not sure if there is a case for an old recipe for veggie haggis, certainly in Liverpool there’s Blind Scouse, Scouse was a stew with meat, spuds, onions etc. If you couldn’t afford meat it was called blind scouse, hence the term Scousers for Liverpudlians. MacSween’s is a butcher’s shop, no? According to their About page – http://www.macsween.co.uk/about-us/ – yes. Well I knew that anyway. Just checking.